Sorry I left you hanging on that last post. I know you're all breathlessly wondering how the election event went, so get settled in, because it was an interesting night! To begin, the event was designed for young olim, and was to be conducted in English. Each of the 7 major parties would send one representative to basically sell their party's platform, answer our questions and essentially put a face to their contingent. The event was held in a hip Tel Aviv bar and the room was divided into tables, so as to create more intimate environments with which to connect with the candidates. Every fifteen minutes, the candidates would move on to the next table, kind of like a "speed-date your politicians" event. My table was made up of some liberals, some left-wingers, some smolanim and some progressives. What I'm saying is- everyone was a Leftist. If you've been keeping up with this blog, I am not a Leftist. But I was prepared for this eventuality, so I brought one of my favorite fellow right-wing olim, Ilan, as a partner-in-crime for the night (no crimes were actually committed, not to worry.) Ilan and I agree on almost all issues, so it was good to know that when I asked a question where every person disagreed with my point of view, someone had my back. And it was fun to make fun of the outlandish Leftist stuff people said with a fellow "crazy right-winger." Next came Yisrael Beiteinu who had to spend most of their time defending themselves from reports of scandal and their party leader, Avigdor Lieberman. I personally don't mind his fiery brand of nationalism, but you know who does? Tel Avivians. They were not on "Team Yisrael Beiteinu" and it showed. YB also sent 2 representatives- one of whom apparently had all the answers and struggled with English, and another who spoke as beautifully as the Prince of England, but had to defer to the Israeli for all the answers. It was kind of a cumbersome presentation, but still informative. Likud sent their #32 delegate to represent them. Weird choice, huh? Even in the absolute best-case scenario, this guy isn't MK-bound. So why was he the rep, you may ask? I don't know for sure, but he is Likud's only openly gay candidate. His goal is to make Likud more gay-friendly and the LGBT community more Likud-friendly. Worthy goals all, but let's face it- Likud knows their audience. A bunch of young people from Tel Aviv will obviously respond best to this specific representative, especially considering their almost visceral hatred of Bibi. It was a good move. I thought he spoke well, except at one point he said he was atheist and in the next breath said the Jewish claim to this land was biblical and Torah- based. It may make sense to more enlightened people, but to a G-d- believing, Torah-thumper like myself, I didn't how those 2 ideas worked together in his brain. Then came the two "centrist" parties, Yesh Atid and Kulanu. I had forgotten all about Yesh Atid, but was interested in what they had to say because I have right-wing friends who voted for them, based on their economic plans. If I can paraphrase their platform "The Left is wrong and the Right is more wrong so vote for us!" They didn't explain how they were right, but I liked that angle. Politicians in the US always come to the middle during elections, and Yesh Atid was owning that middle ground. ("And you get a car! And you get a car! Everyone gets a car!") Over in Kulanu, they sent a real dynamo. Handsome and boisterous, he was like an edition of Us Weekly; super fun to read, with no substance. One hilarious exchange was when he called out all the other parties for "not being accountable" for their mistakes. He promised that if elected, Kulanu would be accountable for all they do. I asked how he could know that for sure, if this was a brand-new party. He told me Kahlon (the party leader), had been in Knesset for a while so I asked what Kahlon had ever done wrong for which he took accountability. This very gregarious man listened, looked at me seriously, and answered an entirely different question altogether. It was humorous for sure, but I did hope for an actual answer. When Bayit Yehudi came to sit down, I was pretty excited. This was the party I wanted to support, and I also wanted to be a friendly face at a table full of very unfriendly, Bayit Yehudi detractors. And then- disaster! The representative had a grasp of English about as good as my grasp of Hebrew. That is to say, he can speak English, he can understand it and he can lightly converse in it. But can he represent his party platform to a group of aggressive olim? Nope. And it was a real shame, too. 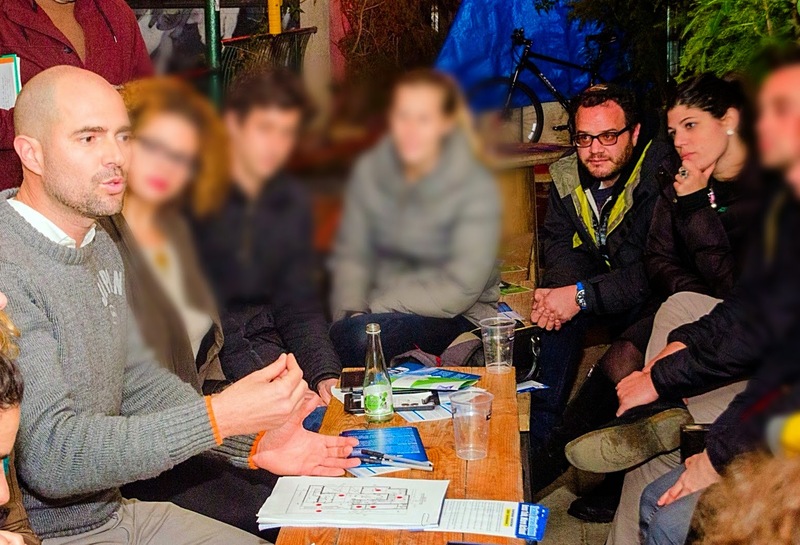 What could have been a great opportunity to endear Bayit Yehudi to a group of Left-wing olim in an intimate setting was an opportunity wasted. Bummer. I saved the Meretz representative for last, because the whole experience was an exercise in absurdity. Meretz bills themselves as the "progressive" party, more to the left of Labor/Zionist Union. With just a quick perusal of their literature I could see, they felt the exact opposite of me on every single possible topic. It was almost humorous, if you can forget about the fact that they actually get elected to some seats in every election. The representative was a nice looking, well-dressed man who confessed to us that, in his youth, he had been a Likud member (gasp!) He followed that up with "Well, we all make mistakes and I switched to Meretz!" which got an appreciative laugh from those assembled. I quickly remarked, "So you also think switching to Meretz was a mistake?" which received an even larger laugh! Two points for the crazy right-wingers! As he continued, he used expressions like "We support a redistribution of wealth." I nearly spit out my Goldstar. In the US, that phrase is often inferred and never uttered. It's political suicide, much as some politicians agree with it in principal. I asked Mr. Meretz if he meant what he just said and he responded "yes, of course." Mind you, this man is a lawyer who probably makes more than 95% of Israelis, and I somewhat tend to doubt that he'd be willing to give away half his earnings to the poor in Ashkelon, but who knows? The whole presentation was one pro-socialism, anti-religion, progressive proposal after another and my mouth was agape the entire time. Still, it was super- interesting to actually hear about, because when on earth will I come this close to a Meretz representative again in my lifetime? During the evening's presentation, there was a little clique sitting across from me, an Australian couple and their newly-acquired friend from New York. (Turns out, our common past as New Yorkers was our only discernible link). They were as Left-wing as I am Right-wing, except they were disgusted that I had the nerve to be there, espousing my views. When I would try to clarify or follow up a question, they would shush me. I kid you not, actually shush me! And when they would ask a question, it was usually a 4-pronged question with multiple follow-ups. To every candidate. When a Right- wing candidate would say something they disagreed with, they would actually snicker in his face, as if this silly person had no right to that opinion. It was a lot to take, to the point where after the 3rd "shush" I said "Please stop shushing me. It may be hard to hear, but you aren't the only people here that matter." They looked shocked, then rolled their eyes at one another, and that, kids, is how fourth-graders do Israeli politics! This event didn't exactly open my eyes or answer any burning questions, but it did give me some more insight into the political landscape here (and drive home the fact that Tel Aviv and I will forever have a complicated relationship). It was cool to have face-time with actual candidates- I've never met candidates back in Queens or had the chance to ask them questions. Mostly, it spurred me on to stay active in the election process, keep reading and searching, and hopefully to arrive at the best possible choice for me as an Israeli. Viva Democracy!